Are you a Noro fan? When I first got back into knitting after a break about 12 years ago, one of the first luxury yarns I discovered was Noro. I fell for it's unique texture and amazing colours. Yarns with long colour repeats and gradient stripes are definitely 'in' at the moment but Noro was there long before anyone else. 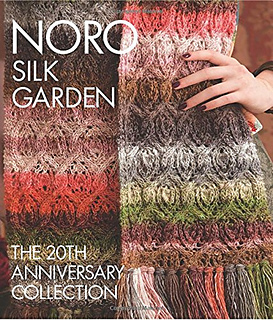 Noro Silk Garden is celebrating it's 20th anniversary this year and to celebrate Sixth & Spring Books have created an amazing book celebrating this colourful yarn. As a long time Noro fan, I was honoured to contribute a shawl. My shawl is an asymmetrical shawl worked sideways with a crescent/triangle shape. Garter stitch is interrupted by bands of an easy lace pattern. 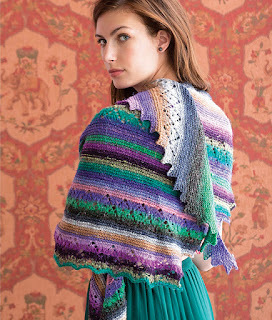 The shawl has a saw-tooth edge along one side and a scalloped lacy edge along the cast/bind-off edge. This shawl uses two skeins (or 600m/200g) of Silk Garden Sock. You can see all the designs on Ravelry (at the time of writing this post, only 6 patterns have been listed on Ravelry but there are 30 patterns in all) and the book is available for pre-order on Amazon now (that's the link to the UK Amazon page). Publication date is June and I'm sure it'll be available from Noro stockists and other book sellers too. All the photos in this post are copyright Sixth & Spring Books and used with permission.